This past week we conducted our semi-annual emergent vegetation monitoring, or “marsh monitoring” as we typically like to call it. The smooth cordgrass (Spartina alterniflora) is seeding and the temperatures have been slowly dropping, which makes for beautiful field conditions in the marsh! This monitoring is the only biological monitoring under the System-Wide Monitoring Program of the NERRs. Many of the protocols we use here at the GTM are based on vegetation monitoring conducted by the National Park Service (NPS) using the Southeast Coastal Network (SECN) Salt Marsh Monitoring protocols. We even collaborate with SECN ecologists in our monitoring efforts at the Reserve! The GTMNERR is biogeographically positioned at an ecotone (transition zone) of two different vegetation habitats: salt marsh (dominated by Spartina) and mangroves (dominated by black mangroves, Avicennia germinans). For a few years starting in 2014, the northernmost record of a red mangrove (Rhizophora mangle) was recorded within the GTMNERR! Today, it has been rumored to now be found near the mouth of the St. Johns River and the northernmost black mangrove off of Big Talbot Island, FL. The long-term monitoring of emergent intertidal vegetation was established to provide a better understanding of the ecological characteristics of these communities as well as to discern the impacts of global environmental (climate change and sea level rise) and anthropogenic (land use and development) changes on the estuarine system. All our marsh monitoring sites are permanent structures (to minimize human impact to the marsh) that we sample on a semi-annual basis. When the monitoring first began in 2012, we sampled the vegetation platforms once a month. After that year, we realized that monthly sampling was unnecessary and we determined the times of peak vegetation biomass to conduct the annual sampling. For our region, peak biomass tends to occur between July and October. Each of our sites were selected based on a set of criteria that provides easy site access, are outside the public’s view-shed, and in regularly flooded marshes. There are three replicate permanent platforms at each site. For each platform, we collect percent cover, species diversity, stem height and density for all species within a 1 x 1 meter-square quadrat. Additionally, porewater (soil water) salinity and marsh elevation measurements are also taken at each platform. We use Rod-Surface Elevation Tables (SETs) to take millimeter measurements of the sediment surface at four cardinal directions to observe the accretion and erosion of at the marsh sediments over time. Rod-Surface Elevation Table with rods being set to rest on the surface of the sediment. Walking the platforms to assess condition. Maintenance is performed each time platforms are visited. This monitoring allows us to characterize patterns in vegetation species composition, abundance, and cover at multiple temporal and spatial scales. Over time we will also be able to determine the influence of environmental characteristics on vegetation patterns. 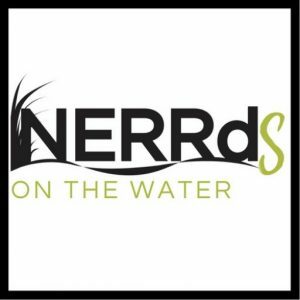 We are very excited to be part of this long-term research and to be able to collaborate with other agencies (like the NPS) to better understand our estuaries! Next Post Mangroves, maintenance, monitoring, oh my!